Are you looking for the Best Restaurants in San Francisco? Here are some ideas for your SF Getaway, with many favorites (**) of my nephew, Dan, who lives in the city. 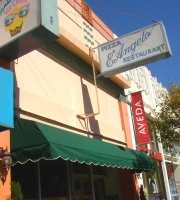 ** Ella's - 500 Presidio Ave. 415-441-5669 Near Laurel Village. Best banana pancakes on the PLANET. Outstanding egg dishes." Mama's at Washington Square - North Beach 1701 Stockton St. 415-362-6421 North Beach's best breakfast. Closed on Mondays. 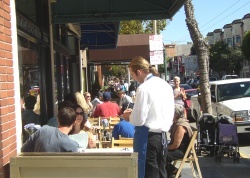 ** Ristorante Milano 1448 Pacific 415-673-2961 "On Pacific in Russian Hill. Small, quaint, and fantastic." Caffe Sport - 574 Green St. 415-981-1251 Sicilian cuisine and Old World decor. Trattoria Contadina - 1800 Mason St. 415-982-5728 well known by locals is just a block off Columbus on Mason. They've served good, authentic Italian food since 1983. ** Izzy's Steakhouse - 3349 Steiner St. 415-563-0487 moderate/ expensive. In the Marina. Very good. - My nephew, Mike's, favorite! La Folie Union Square - 2316 Polk St. 415-776-5577 Very romantic, incredible food & service. **Wasabi and Ginger Marina 2299 Van Ness Ave. 415-34-1368 "Excellent. Free valet parking. On Van Ness"
**Sushi Groove 1916 Hyde St. 415-440-1905 "Smaller - In Russian Hill. Very good." **Little Star "3 locations in the city - deep dish pizza...mmmm..."
**Gordo Taqueria "Cheap, burritos - four of them in the city." **Zarzuela Russian Hill - 2000 Hyde St. 415-346-0800 "Moderate/ expensive, very authentic Spanish cuisine." ** Burma Super Star In the Inner Richmond - 309 Clement St. 415-387-2147 "Call ahead to put your name on the list."